This EP is a blast! It takes subtle elements of dubstep and sprinkles them onto an indie/punk furnace. Once you’ve hit play it’s impossible to stop, especially with the variety it offers, from the fast paced pulsing groove of ‘This is Britain’ and ‘Collapse’ to the methodical melody of ‘Push Forward’ and ‘They Tell Me’, and finally to the break neck speed and contrasting club vibe of ‘The Opposition’. There’s so much variety here. From the opening track no time is wasted. You’re straight into the rant with a concise, liberating beat, guitar complimented by bass, snare and high-hat. The verse sees you nodding your head while the chorus gives you the full force of the power – speed and melody. Half-way through is the ideal time for a dance interlude and then it’s back to the riot! From there it’s a short trip to another explosion directed right at “YOU!” Versatility is present throughout, just when you think you’ve grasped the band – bang! Something new and surprising happens. The twists and turns are sure as hell keeping me hooked! ‘Dark Matters’ brings something that this writer for one have certainly missed – an aggressive political message. Each track is a journey through the rebellious mind-set of a band with some seriously powerful opinions and thoughts. Indeed, I’m not rebellious anymore, I sold my self-respect and became a drone a while ago, but by the time this EP ended I was raring to stand up, raise a mob and run a revolution. 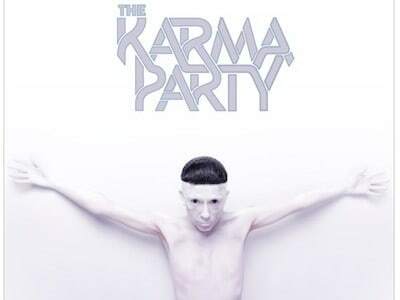 I’ve always loved the whole stand-up-and-fight-for-what-you-believe mind-set that so few artists indulge in nowadays, and The Karma Party are a clear sign that the vibe isn’t dead, which is simply brilliant. This band know what they believe, and they have taken a bold musical revolutionary step forward, and given time I’m sure they’ll be able to stand proudly with Minor Threat and all those other genre-defying acts. But if you’re not into that, don’t be put off by it. ‘Dark Matters’ is essentially a fun, versatile indie/punk album, they just have a lot to emote, and dark as the tracks may seem on the surface, the tongue-in-cheek tone brings a feel good vibe, and what’s to be argued with there?